Bamboo has so much potential as a building material. 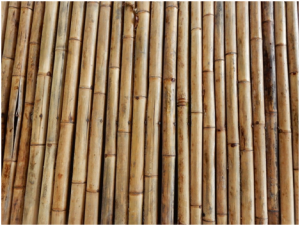 Non-toxic, durable, renewable and environmentally friendly, bamboo is strong and cheap. Unlike wood, you don’t need to wait decades for it to mature, and it’s even possible to grow your own. Bamboo isn’t difficult to work with, as it doesn’t weigh very much. Its strength can rival that of steel, and yet it’s nowhere near as heavy as concrete, wood or metal. Bamboo has what is called an extremely high strength to weight ratio. Cylindrical in shape, bamboo is hollow in the centre, which makes it very light. There’s no shortage of bamboo, as it grows incredibly fast, and in a huge range of conditions. Bamboo is incredibly versatile, and according to this report from The Guardian, you can even make a bicycle from it. It’s also a good choice in earthquake prone areas, as bamboo structures can withstand a lot of force, and even if they do collapse, they’re unlikely to cause serious injuries. 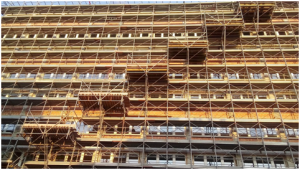 The drawbacks of bamboo, largely preservation and joinery, are now negligible. Beetles used to eat bamboo, but now it’s known that there are substances used in fertiliser, which are harmless but which will discourage insects. The other issue was the joints, as over time these could come loose. Research has shown that bolts, combined with a material such as mortar that becomes solid, will result in a joint that is stable throughout changing seasons and weather. Designing a building with plenty of triangles means that the building is very effective at bearing large loads. This kind of design is seen in a tensile fabric structure or in geodesic domes, where their elements are in compression or tension, and this leads to a building that is very light, and at the same time, very strong. If you are interested in discovering more about the possibilities of a tensile fabric structure, it would be a good idea to consult experts in the field, such as http://www.fabricarchitecture.com/. Bamboo has many applications. It is also attractive, and as bamboo design evolves, it will be used more and more. As it doesn’t cost much, it has many possibilities in areas of the world where low income housing is required, but it can also look stylish enough to be welcome anywhere. Next Next post: Could robots take over from financial advisers?